1. Another decline? : U.S. stock futures are edging lower and European markets are firmly in negative territory. Investors may have been unsettled by news that the U.S. and several allies had launched airstrikes against ISIS in Syria. Oil and gold prices ticked higher. European sentiment was knocked by a purchasing managers' survey showing growth in eurozone manufacturing and services continued to weaken in September. The preliminary reading of business activity fell to its lowest level this year. Asian markets ended with mixed results Tuesday. 2. New Treasury rules hit pharma stocks: Investors are considering the implications of new rules from the U.S. Treasury that will make it harder for U.S. companies to reduce their tax bills by merging with foreign firms and moving abroad. The tax-avoidance process, known as inversion, has been all the rage in the corporate world this year. Shares in AbbVie (ABBV) could take a hit when trading opens as the firm had been planning to slash its taxes by moving its legal home out of the United States through a $54.7 billion takeover of the British firm Shire (SHPG). Shares in Shire were dropping by over 6% in London -- the biggest decliner on the FTSE 100 index. Shares in British pharma group AstraZeneca (AZN) were also falling by 5% as investors expect that Pfizer (PFE) will be deterred from making another takeover bid for the company. 3. Monday market recap: U.S. stocks closed lower Monday. 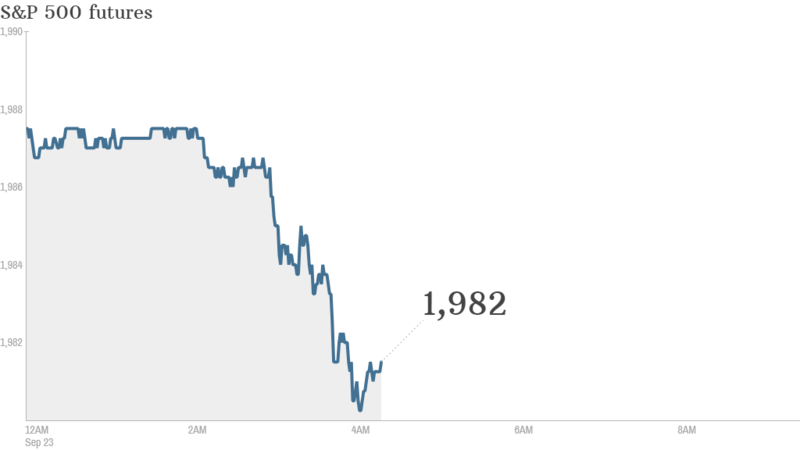 The Dow lost 107 points while the S&P 500 fell 0.8% and the Nasdaq slid 1.1%. Despite the dip, all the major indexes have made significant gains and hit record highs since the start of the year. 4. Earnings announcements: CarMax (KMX) and Carnival (CCL) will report earnings before the opening bell. Bed Bath & Beyond (BBBY) will report after the close.